So far in the short river season we have caught some decent wild trout in the Derwent, the Tees and the Eden as we reported recently on You Tube . 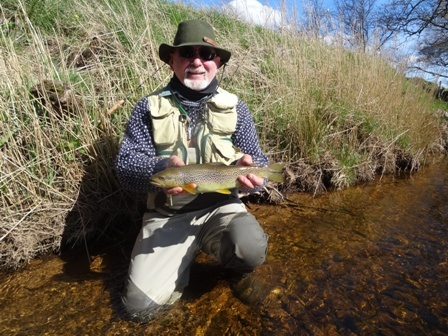 It has been typical early season river fishing, in that the fish are scarce and the hatches of flies sparse. Worst still we came out of a period when the rivers have flooded continuously. Except in the past 3 weeks it has barely rained and therefore now to compound difficulties, trickles of water in flood eroded cavities confront the start of the new season. 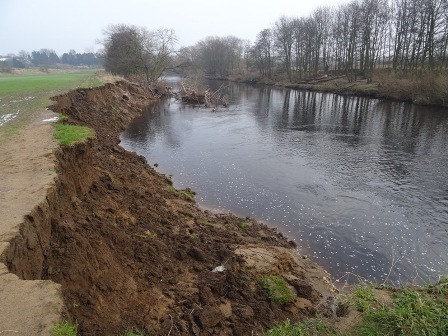 Flood damage on the Middle Tees. This is about as tough as conditions can get. Rivers on their bones, cool easterlies and a half dozen Dark olive duns witnessed if you are lucky. But we have found sport on dry fly to be the most effective method with the rivers so low. The soft hackle dry fly featured in our You Tube video on the Eden has been the fly capable of bringing them up ...just enough to save a day. An early season wild Tees trout is returned. So these early season trout are to be especially appreciated. This brief period of drought is now over. With a flush of rain on fining down rivers we can only now perhaps make any meaningful comparison with years gone by in terms of fish density and hatches of invertebrates like the large dark olive. But wild trout by their nature are natural born survivors. 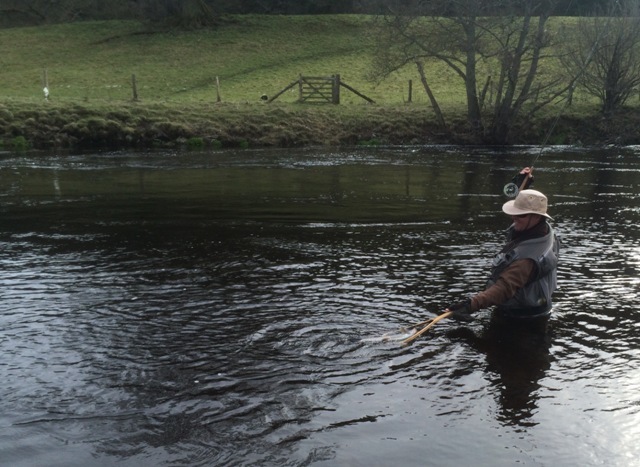 Landing a good quality grayling on the upper Dee near Corwen. Before the start of the trout season we made our last bid for a specimen grayling before that season ended on the 15th March. We travelled to the upper Dee and fished the Corwen anglers water Crogen Beat 2. This was a breathtaking piece of water in a stunning part of the UK. It was tough but I did catch a good fish. Unfortunately it was camera shy and did the usual grayling trick of slipping back like the proverbial bar of soap. Now we are into April the March Browns will be on the menu. 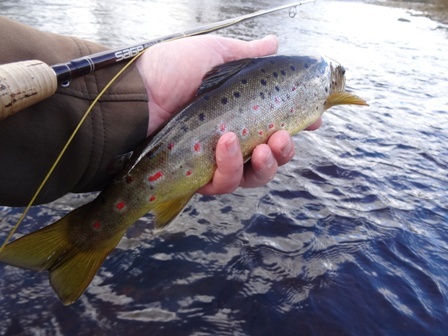 See the latest issue of Trout Fisherman for our article on fishing a March Brown hatch. When the March Browns hatch, the pulses of most river fly fishermen raise accordingly. It is an excellent time to catch larger than average UK wild trout on dry flies. Descending into the Eden valley in April. 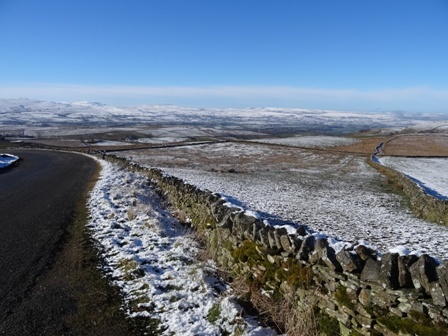 Our latest guided venture in April on the Eden took advantage of this although the picture descending into the Eden valley might be more reminiscent of mid-winter with snow laden hills an indication of the previous nights near zero temperatures. Nevertheless we managed to land stunning wild brown trout using the onstream-guide soft hackle dry fly, which is an excellent March Brown imitation. Our fly range is now fully available again. Eden early season trout on the soft hackle dry fly. We hope your rivers and streams have retained their resident wild trout. Best wishes in this part of the season. 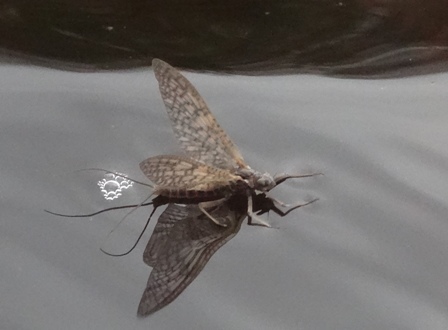 Magic May is on the way... May is typically an optimum month for the dedicated river fly fisher. Best wishes, Jonathan and Nellie.